Would information obtained during an fMRI examination be sheltered by Fifth Amendment protections against being compelled to be a witness against yourself? 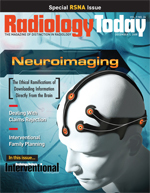 Neuroethics attempts to address ethical issues surrounding rapidly advancing imaging technology. In the film A Clockwork Orange, a psychiatrist says to one of the main characters, “I’m going to show you a picture, and you tell me what that person might say.” What if the doctor could change that question to “tell me what that person is thinking”? Both imaging professionals and legal experts are pondering that topic as researchers investigate MRI as a tool for gathering information from inside someone’s head. Brain scans taken with functional MRI (fMRI) can show activity that occurs as a subject answers questions. Depending on where that activity occurs in the brain can show whether that person is telling the truth or how the subject feels about the question topic. However, many questions remain surrounding the ethics of how that information is collected and in what context it is used. Some of those questions have potentially disturbing answers. Paul Root Wolpe, PhD, director of Emory University’s Center for Ethics, is a founder of the field of neuroethics, which involves the study of the ethical, legal, and philosophical dilemmas that can occur due to advances in brain science. The field grew out of a 2002 conference on the topic, and since that time, the University of Pennsylvania and Stanford University jointly founded the first academic centers for neuroethics in the country. Wolpe was a professor in the University of Pennsylvania’s Center for Bioethics before moving to Emory this year. In addition, the Neuroethics Society was formed in 2006 to further explore issues faced in the field. Wolpe serves on the society’s governing board, which promotes interaction among professionals within the field and brings attention to neuroethics issues. While members of the organization have been gathering in small groups during the past few years, the first official meeting was scheduled for November 13 and 14 in Washington, D.C., just prior to the Society for Neuroscience meetings. MRI’s medical usage history is well documented. MRI, particularly fMRI, as a brain-scanning tool evolved over time, Wolpe says. As an ethicist, Wolpe looks at the social and ethical implications of brain scans. He believes people are missing the potential implications of fMRI brain imaging and neuroscience. Neuroimaging involves various techniques to image brain structure and/or function. Most MR images show only the structural aspects of the brain, revealing anatomical findings such as tumors and injury. Conversely, fMRI shows the presence of specific activities in areas of the brain. It can be used to image metabolic disease and for neurological and cognitive psychology research. Functional imaging shows activity in information processing centers within the brain as they react to different stimuli. Increased metabolism that occurs during the brain’s processing of information causes those areas to “light up” on a brain scan. fMRI is one of the more recently developed neuroimaging techniques, known for its low invasiveness, lack of radiation exposure, and relatively wide availability. Event-related fMRI can study brain activity during stimulated deception by measuring the dynamic regulation of blood flow in the brain as it relates to neural activity. Neurons, like all other cells, require energy to function, which is supplied by blood flow. Active neural areas receive more energy, while inactive areas receive less energy. That energy is visualized with fMRI. Wolpe points out that people look at the brain for a number of reasons. Early uses for fMRI included looking for conditions such as dyslexia or other functional disorders. Recent uses hit the commercial market for the purpose of lie detection. Two companies currently offer fMRI lie detection services commercially: No Lie MRI and Cephos Corp. Both companies use fMRI to measure the activity in the brain rather than the peripheral nervous system, such as with polygraph testing. A subject undergoes an MRI of the brain, during which structural and functional data are gathered by asking a series of questions. The data are then analyzed. Potential clients for these services include corporations, security firms, insurance companies, lawyers, and federal, state, and international governments. Christos Davatzikos, PhD, a radiology professor and director of the biomedical image analysis section at the University of Pennsylvania, sits on the scientific board of No Lie MRI and was involved in the automation work for the company’s lie detection technology. Davatzikos refers to this technology as “not highly experimental but actively in the research stage and moving rapidly. Polygraph tests measure respiration, blood pressure, and the skin’s ability to conduct electricity—all physiologic responses. The belief is that someone who is lying breathes faster, has higher blood pressure, and perspires more than someone telling the truth. Although polygraph testing has improved over the years, the U.S. Supreme Court has yet to rule on its admissibility as evidence in a court of law. In light of that fact, state and federal courts are mixed on whether to accept polygraph test results as admissible. That’s where proponents of using fMRI in this capacity believe the technology could make headway within the legal system. Wolpe says there’s little legal precedent when it comes to brain scans. Brain images are often introduced in court to try to determine mental capacity, he says, and current criminal law allows government agencies to draw blood from a suspected drunk driver. Whether someone can be forced by a court of law to undergo a brain scan has yet to be determined; ordering someone to undergo a scan and obtaining it are different matters. Wolpe says further analysis needs to be done for experts to understand what brain scans can and cannot do. While brain imaging may be helpful with job candidate screening or personnel testing, it may not provide enough detail for use in a criminal trial, where the standard of proof is higher. Legal systems internationally, however, are looking at the potential of brain scans as viable evidence. According to a news report in the International Herald Tribune, a judge in India this June convicted a woman of murder based on evidence that included a polygraph and something called the Brain Electrical Oscillations Signature test, developed by an Indian neuroscientist. The test begins with an electroencephalograph, with the resulting brain images processed using software that tries to detect whether the brain lights up in specific regions that, according to the inventors, show measurable changes when experiences are revealed. The technology claims to be able to distinguish between memories of something the person witnessed and something they actually did. Wolpe notes concern with the way some people, such as jurors, may place a higher level of importance on information obtained via brain scans because of the high-tech way it is gathered. They perceive the technology as a more accurate and objective method of lie detection. What most people don’t understand, however, is that there are many layers of signal processing, statistical analysis, and interpretation involved in the process and that these complexities are subject to variations. In regard to brain imaging information for use in the courtroom, ethicists look to the Fifth Amendment, which says no person shall be compelled in any criminal case to be a witness against himself. The rationale of that is to prevent coerced, and therefore unreliable, testimony and protect citizens’ privacy. However, this is just one example, and Wolpe notes that as more is learned about brain imaging, the legal debate will continue. Davatzikos adds that No Lie, along with the University of Pennsylvania, is trying to conduct a large-scale study to examine brain activity under more conditions in the hopes of moving fMRI for lie detection closer to reality. In addition to the legal issues surrounding information gathered with brain scans, there is the ethics of what to do if a scan conducted for one purpose reveals unrelated yet important data. Wolpe uses the example of a potential employee undergoing an fMRI of the brain for use in determining whether that person would be a good leader within the company. In the course of analyzing data gathered during the scan, evidence of former cocaine use is detected. However, the candidate has been “clean” for 10 years and is completely rehabilitated from the addiction. What is the test provider’s responsibility to disclose that information when that was not the purpose of the scan? Another issue would be what would happen when testing a job candidate’s truthfulness also uncovered potential tumors or other medical pathologies. Who would have what duty to report these findings and to whom? “We need to determine what can be done with data like that,” Wolpe says. This leads to the question of who should conduct and analyze brain scans for nonmedical purposes. Confidentiality is key, along with technical knowledge. And then there are the guideline issues. MRI technologists require licensing in most states. Could they be compelled to perform nonmedical exams, or would the government ordering such a scan have to hire and train technologists? The same questions could apply to the person reading the images. Davatzikos says the science and technology used for brain scans can be different with each use. MRI used in cancer detection has a protocol and is conducted by medical professionals who follow preestablished guidelines. Brain imaging for nonmedical purposes gives the technology a whole new purpose. As functional neuroimaging technology grows beyond its original intended uses, ethical questions will confront medical and legal professionals, who will need to sort out protocols for how that information will be collected and used. Neuroethics is attempting to address those questions now.